You could be forgiven for assuming the global economy is facing enormous headwinds. 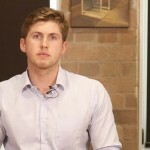 The US-China trade war is creating global equity market volatility; the Brexit mess and Italian public budget dispute is prolonging fears of European Union instability; and even the Australian housing market is now looking fallible. But it is worth remembering that the US economy – the world’s largest and one that accounts for a quarter of total global economic output – is at the strongest its been in more than a decade. Shown below, the last two quarters of real economic output have grown by more than three per cent. The primary reason of this acceleration? Fiscal stimulus. That is, reduced taxation and increased spending by the government. 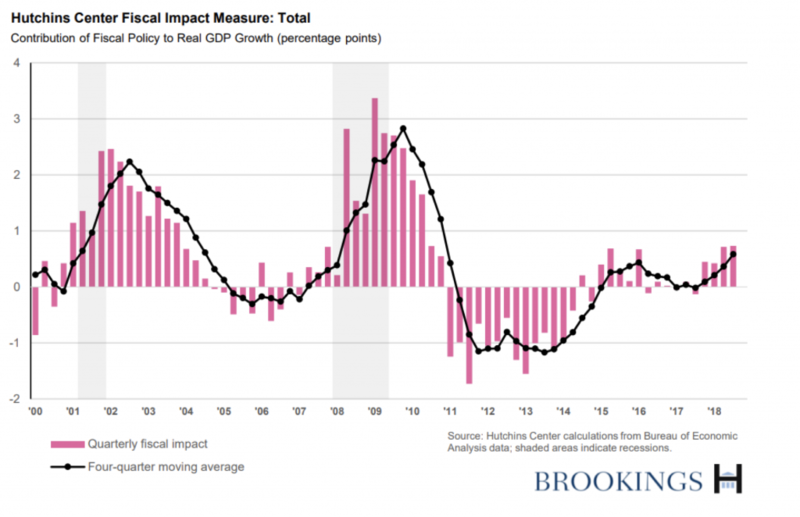 As estimated by Brookings below, over the last five quarters or so, the contribution to US economic growth from fiscal stimulus has increased from zero to almost one per cent. The tax cuts enacted by the Trump Administration in December 2017 were a significant contributing factor here. Among other reforms, these tax cuts included a significant reduction in the US corporate tax rate from 35 per cent to 21 per cent. The question, of course, is one of sustainability. According to the Congressional Budget Office (CBO), the US federal budget is expected to be in the red by about two per cent of GDP on an annual basis. And this is before government interest payments on its borrowings. When interest expenses are layered on, the annual public budget deficit is closer to five per cent per annum for the next decade – and is projected to deteriorate thereafter (shown below). Thanks Andrew, informative as always. This is something that genuinely confuses me. What could possibly be the long term plan / outcome of the $21tr US debt, and growing every year. It can’t go on forever can it? It’s a great question. You might be interested to learn about a new strand of economic theory which is gaining popularity in some parts called Modern Monetary Theory (MMT). 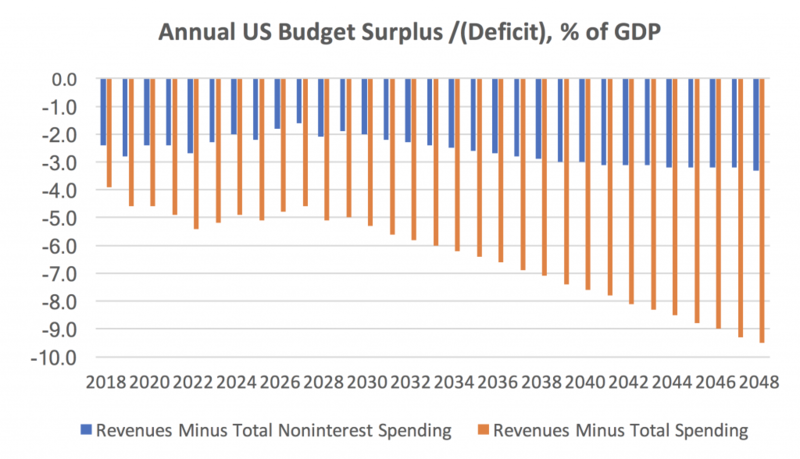 Proponents of MMT argue that a sovereign nation that issues debt in its own currency can never go bankrupt, therefore, the debt level in and of itself is not a concern. Instead, the money supply and resulting inflation are the outcomes that matter. Modern Monetary Theory believe in perpetual motion machine. Monetary sovereignty is not something government decides. Confidence and use of a fiat currency is not dictated by government nor does it give said government the power to do what it wants with monetary policies. The value of the currency is not dictated by the government, but by the latest purchase agreements made with such means of payment. Countries don’t borrow in foreign currency because they are dumb, but because savers don’t want government currency debasement risk, no matter what yield. As such, governments cannot unilaterally decide to issue “all the debt they need in local currency” precisely because of the widespread lack of confidence in the central bank or the governments’ perverse incentive to devalue at will. As reserves dry up, and citizens see that their government is destroying purchasing power of the currency, the local savers read their minister’s talk about “economic war” and “foreign interference,” but they know what really happens. Monetary imbalances are soaring. And they run away. Im with you Xiao, and that link you posted should be compulsory reading for everyone. It amazes me that nobody talks about this stuff, it’s almost taboo in well to do circles of apparently well informed people, they think your a wacko for criticising the monetary system, but in reality it’s our failed system that causes all if not most of our financial, social and political problems. For as Henry Ford himself once said “ it is well enough that the people do not understand the banking and monetary system, for if they did I fear there would be a revolution before tomorrow morning.